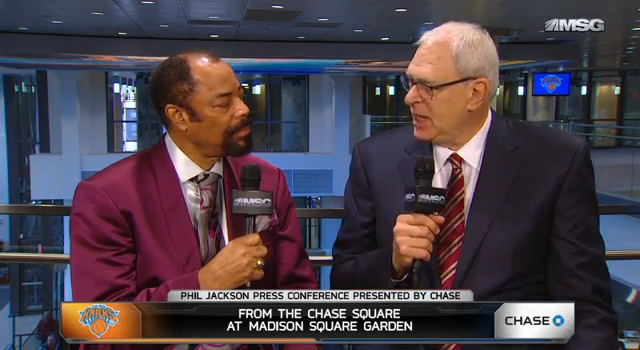 Right after the big press conference yesterday, new titled Knicks president Phil Jackson sat down with friend and old teammate Walt “Clyde” Frazier to discuss his new position and the future of the franchise. Jackson spoke about the need to revamp the roster (“the players have to have a certain sense about themselves…”) and the importance of going back to the fundamentals of basketball (read: DEFENSE). Jackson specifically pointed out the problem with our perimeter players being blown by and relying solely on Tyson Chandler for rim protection. What I already like about Jackson’s approach is the sense of calm and logic he’s bringing to his role. Lord knows the Knicks have been a chaotic, roller-coaster bunch. It’s readily apparent that Jackson already knows what he wants to do with this squad.